In your quest for losing weight you will many remedies, but most of them will fail. This is because most weight loss ideas are almost always wrong for your health, and does more harm than good. Have you tried homemade drinks to lose weight? Lemons are rich source of vitamins and nutrients. Lemon juice in warm water kick starts your digestive tract and clean out colon (part of digestive system). Mix fresh juice of a lemon in two quarts of filtered and chilled water. Know add half a teaspoon of ground cayenne pepper to it. If you want it to be sweet then add half a teaspoon of maple syrup to it. Lemonade with maple syrup is a popular homemade weight loss drink. However, its effectiveness is yet to be proved. Mix 1 cup of tomato juice with 1 cup of yogurt without fat, add ½ teaspoon of lemon juice. Know add grated ginger, pepper and salt to taste. After mixing all the ingredients blend them for 30 seconds and serve in glass. Take a glass of skimmed milk and add 2 teaspoon of chocolate extracts to it. Know mix ice and blend the mixture for one minute to get thick and frothy shake. Cocoa present in milk shake contains antioxidants that aid in fat burning process. The other ingredient .i.e. skimmed milk is low on fat and high on nutrition level. The simplest homemade weight loss drink is cold water. If you drink 8 to 9 glasses of water then you can burn an estimated 200 to 250 calories in a day. Drinking a glass of water half an hour before meals will make you feel full and you will naturally end up eating less. Another delicious homemade drink to lose weight is fruit smoothie. 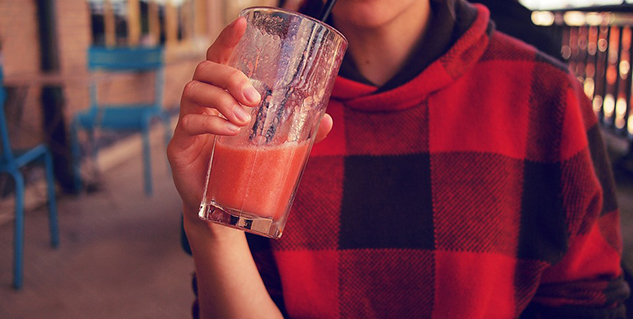 Take fruit smoothie as an alternate to fattening drinks. You can take them as a treat after your workout and in breakfast. Fruit smoothie is mostly made with yoghurt, ice and fruit. You can even prepare this recipe with soy or skimmed milk. Take one cup of yoghurt and add a cup of fresh berries and ice to it. Blend them in blender or smoothie maker to get desired consistency. Another homemade drink for weight loss is herbal tea. Herbal teas, ginger teas, green tea and dandelion tea are some good weight loss drinks. Dandelion tea detoxifies blood stream while the green tea keeps check on cholesterol level and reduces it. Cranberry juice contains vitamins, minerals and nutrients that promote healthful lifestyle and improve metabolism. It support quick and effective weight loss by mobilising body fats and converting them to energy needed of various activities. Along with drinking juices you must also eat other nutritious foods in order to keep fit and fine.